This convenient Summerhouse-come-Shed was recently installed for a customer based in Dereham, Norfolk. This functional hybrid was designed and hand-built at our Norfolk factory before being both delivered and installed by our expert team of in-house fitters. This attractive Superior Shed was recently installed at Brancaster Sailing Club on the Norfolk coast in order to provide extra storage space for sailing equipment. As with all of the high-quality, FSC® certified timber buildings produced by Crane, the shed was designed and built at our Norfolk factory before being both delivered and installed at the customer’s address. Our stunning National Trust range captures the true essence of a traditional shed for a traditional garden and are inspired by the buildings within National Trust Estates. 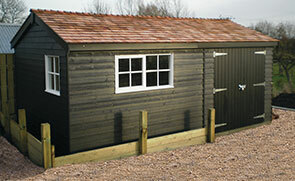 If you are looking for a more contemporary style, you may like to consider our wider range of timber garden sheds. This Cley Summerhouse was recently installed for a customer based in Norwich, Norfolk, who wanted it for use as a garden office. This is just one of our wider range of timber summerhouses, all of which include delivery and installation as part of our exceptional service. This spacious Satlhouse Studio was recently installed for a customer based in the Sprowston area of Norwich, Norfolk. The customer wanted the sleek appearance of the Salthouse along with the working office feel of the Langham. Therefore, they worked with our experts to create the ideal building for their needs. This charming Greenhouse was recently installed for a customer based in Burnham Market, Norfolk. Seeking an attractive, high-quality and reliable greenhouse in which to store their prized potting plants, the customer opted for the 1.8 x 2.4m size. This stunning Blakeney Summerhouse was recently installed for a customer based in South Wooton, Norfolk. 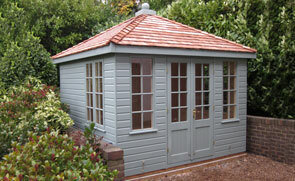 A classic, chalet-style summerhouse, this building has an apex, overhanging roof covered with our heavy-duty heat-bonded felt. Measuring 2.4 x 1.8m, the summerhouse has polished brass door furniture ands 4 fixed windows to allow for plenty of natural light. This Salthouse Studio was recently installed in Morston, Norfolk, for a customer who opted for one of our spectacular green sedum roofs. Measuring 4.2 x 4.2m with 6 full-length windows, the studio is filled with natural light and makes the perfect space for an artist. The customer worked alongside our building experts to add an internal partition wall to the building as well as an external door to access this separate storage area. 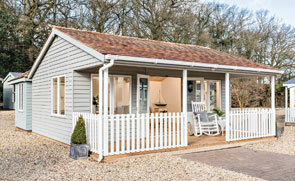 One of our lovely Wiveton Summerhouses was recently installed for a happy customer based in Honingham, Norfolk. Measuring 3.0 x 3.0m and featuring internal insulation, it’s the ideal year-round space from which to enjoy the outdoors. 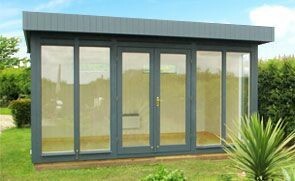 This multi-functional 3.0 x 4.2m Salthouse Studio has been installed in our customer’s garden in Thetford, Norfolk to use as both an office for the customer to work from home in, and a garden storage shed with the help of a partition that splits the building into two.